or update it as you needed when you view your order. ** Mint mark(D, P or S) and one of our national mottos, "E PLURIBUS UNUM" is on edge of the coin. 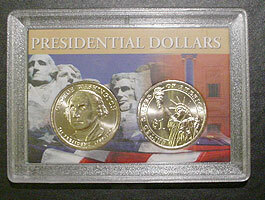 For other Presidential dollar coins, please click here. This proof coin struck multiple times with specially polished dies to create the brilliant, sharp relief and mirror-like background of a proof coin. The frosted, sculpted foregrounds give this coin a special "cameo" effect, created by the exacting proof process. Made by bronze, 90% Copper and 10% Zinc and the size is 1 5/16" (33.5 mm), smaller than the Ike dollar coin and bigger than Kennedy half dollars. Made at Philadelphia Mint but there's no mint mark. Packed by individual medal in Mylar pocket. For other Spouse Medals, please click here. Buy Complete Set and save time and money, These sets come with FREE Shipping! 14" x 12" fold, 14" x 24" unfold. Size: 9" x 3 1/4" x 1 3/8"
* Rolls are not included. 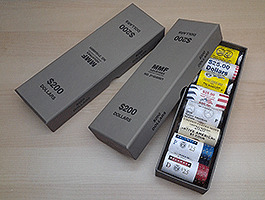 You can use this boxes not only for Presidential dollar rolls but also Sacagawea and Anthony dollar rolls. Special Holders for Presidential dollars. 2 Holes - 2" x 3"
4 Holes - 3.5" x 5.5"
For long term storage, please try these coin tubes and 2" x 2" card board holders. This site powered and secured by Yahoo!